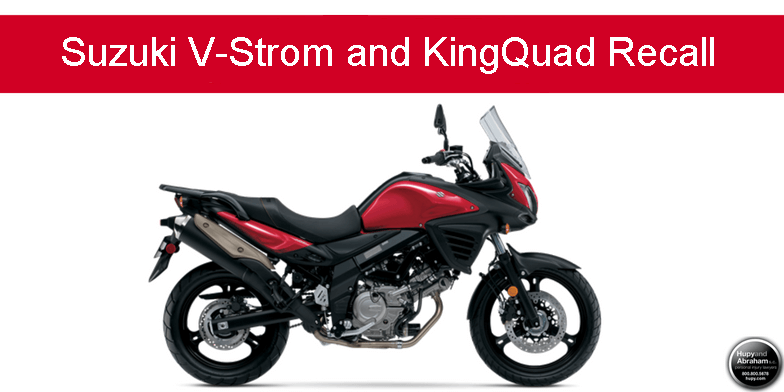 Suzuki V-Strom and KingQuad Recall | Hupy and Abraham, S.C.
Suzuki has issued a recall for 2012-2016 V-Strom 650 (DL650) motorcycles, manufactured from August 30, 2011 through October 12, 2015. Affected products also include the V-Strom 650XT, and roughly 3,400 model year 2016 and 2017 KingQuad ATV's (LT-A750X and LT-A750XP). Suzuki recall announcements indicate there may be an issue with the alternator stator having insufficient heat resistance, resulting in a short circuit to the stator wires that could cause battery charge failure and engine stalling. The recall was announced to NHTSA from Suzuki on December 2, 2016, campaign number 16V878000. Suzuki will contact affected owner and replace the stator for free. Owners can also contact Suzuki customer service at 1-714-572-1490. At Hupy and Abraham we support having fun while staying safe. Visit www.hupy.com to stay up to date on the latest motorcycle news and events, and click HERE to get your free "Watch for Motorcycles" sticker today!